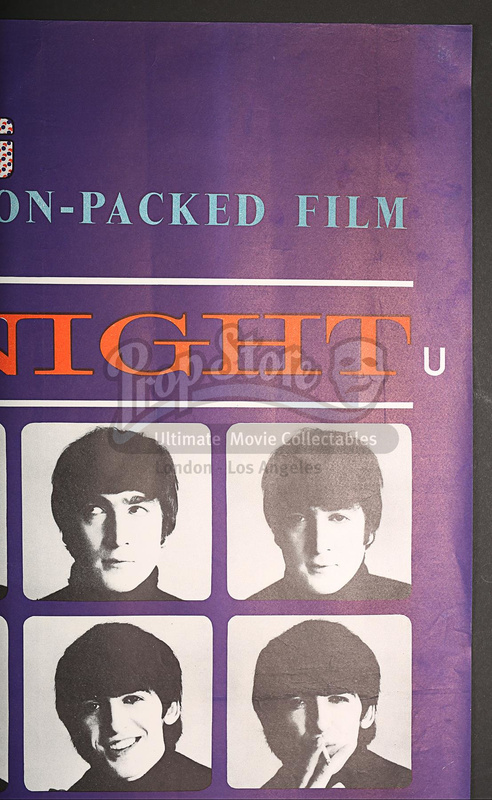 Cinema Poster Auction (#128) 06/28/2018 12:00 PM GMT+1 CLOSED! 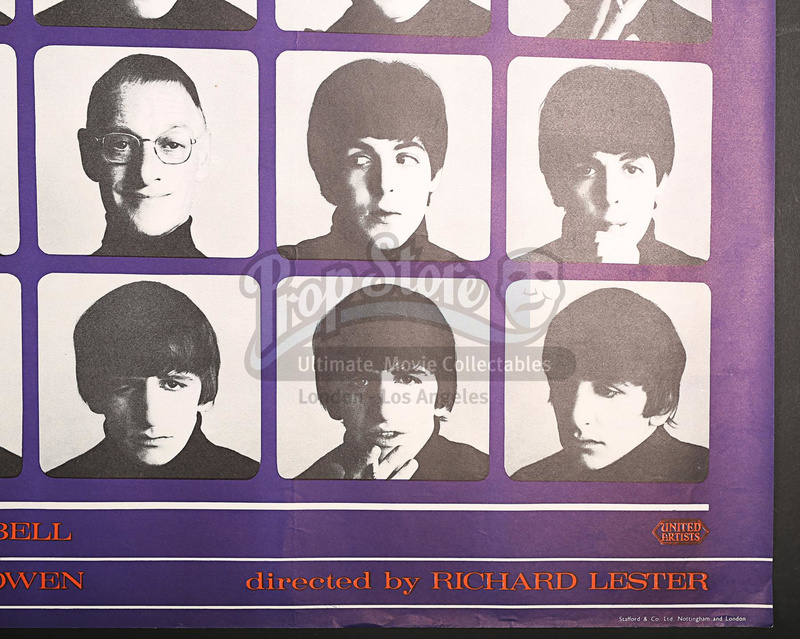 The global phenomenon of "Beatlemania" was in part fuelled by The Beatles' willingness to give time to perform and provide musical scores for their own films. 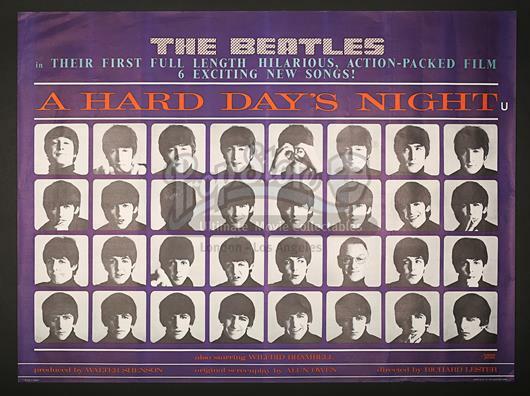 "A Hard Day's Night" was the debut in the series and the Quad poster was based on Robert Freeman's design for the LP soundtrack, the light-hearted, cheeky style very much in keeping with The Beatles' image. 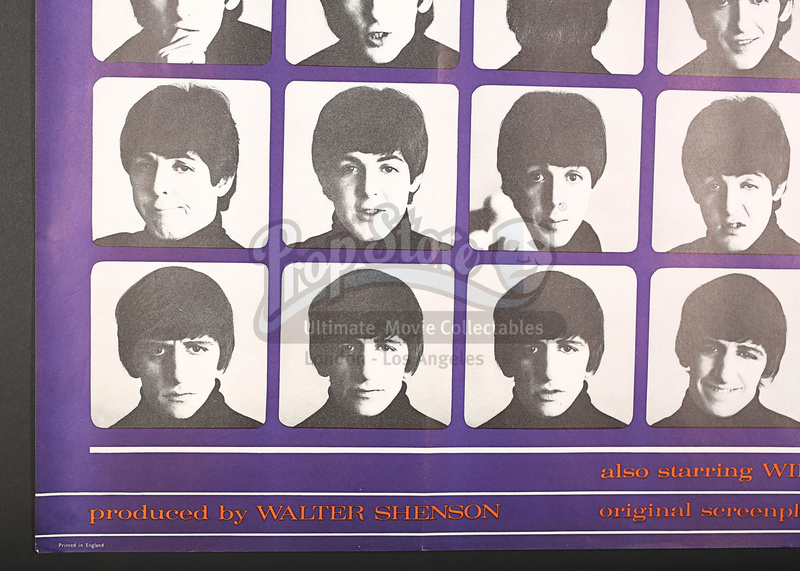 Freeman photographed all The Beatles LP covers during the period 1963-65. Near mint and rolled with 3 very faint vertical folds and a small crease top left corner. The auction is being held live in London on June 28th at 12pm BST. Bidding can be done in person, via Prop Store’s online auction platform, or telephone. The following are suggested bid increments for the Auction. Please be advised that they are suggested increments only, are not intended to be and shall not be binding, and the Auctioneer retains the sole and absolute discretion, at the time of the Auction, to change, modify, or vary the bid increments at any time. Payment can be made by Visa, Mastercard, American Express, cash (to a limit) and bank transfer. Buyer's Premium of 23% (plus VAT if applicable) will be added to all winning bids. An additional 2% (plus VAT if applicable) of the aggregate amount of the Hammer Price and Buyer's Premium will be charged for any lots settled via Credit Card. [†] These lots are sold under standard VAT rules. For buyers within the EEC, 20% VAT will be due on the hammer price; 20% VAT will also be due on the Buyer’s premium (as well as Credit Card Fee if applicable). If EEC based buyer is a business outside of the UK who has provided their VAT number, no VAT will be due. When lots are exported outside the EEC (proof of export required or shipped by Prop Store or through Prop Store’s authorised shipper), no VAT will be due on the hammer price; 20% VAT will be due on the Buyer’s premium only (as well as Credit Card Fee if applicable); unless items are exported to a registered business outside the EEC, in which case no VAT is due. [Ω] These lots have been temporarily imported from outside the EEC for sale at auction in London. For buyers within the EEC (private individuals or registered businesses), 5% VAT will be due on the hammer price; 20% VAT will also be due on the Buyer’s premium (as well as Credit Card Fee if applicable). When lots are exported outside the EEC (proof of export required or shipped by Prop Store or through Prop Store’s authorised shipper), no VAT will be due. [M] These lots are sold under the margin scheme. For buyers within the EEC (private individuals or registered businesses), no VAT will be due on the hammer price; 20% VAT will be due on the Buyer’s premium (as well as Credit Card Fee if applicable). When lots are exported outside the EEC (proof of export required or shipped by Prop Store or through Prop Store’s authorised shipper), no VAT is due. Payment plans over a maximum of 3 months are available for all lots. Payment plans require an immediate 20% non-refundable down payment. The balance can be paid off in equal installments over the agreed months. All funds are non-refundable. No cancellations, transfers, or exchanges will be accepted. Your piece will be safely set aside for you and will ship once the balance is settled in full. The Buyer is solely responsible for all shipping, handling, and delivery costs. Prop Store can help you arrange packing and shipping through FedEx for smaller items or Precision Cargo for larger items or you can use your own licensed carrier, approved by Prop Store. Customers are strongly advised to request a shipping quote prior to bidding. Email here and we will aim to provide you with a comprehensive shipping quote within 1 working day, though freight quotes for oversized items may take longer. Please be advised that certain Lots are highly fragile and should be handled with caution. Prop Store recommends that the Buyer collect such Lots locally from Prop Store if possible. By participating in this auction you are agreeing to our Terms and Conditions. The full terms and conditions can be found below. This Buyers’ Guide contains a brief overview of Prop Store’s auction process and the terms under which Lots are made available for sale at auction. A more detailed statement of our Terms and Conditions of Sale follows after this Buyer’s Guide. Please read the Buyer’s Guide and the Terms and Conditions of Sale carefully. By registering to bid and participate in a Prop Store auction, you will be deemed to have agreed to be bound by them. 3.1.1. Every person or organisation wishing to make a bid is required to register with Prop Store before participating at an Auction. 3.1.2.2. a person registering as an agent to bid on behalf of a third party must bring the appropriate identification documents as set out above for themselves and for the third party on whose behalf they are authorised to make a bid and provide to Prop Store a signed authorisation from the third party confirming their authority to participate at the Auction on that third party’s behalf. 3.2.2. During the Pre-Auction Viewing period, as set forth in the Auction catalogue, any Bidder may preview Lots free of charge by appointment with Prop Store. 3.3.1. Without any liability, Prop Store can provide shipping estimates before the Auction; a Bidder requiring this information should email shipping@propstore.com including the Lot number and shipping address at least 3 working days before the start of the Auction. 3.4 Bidders outside the U.K.
3.4.1 If the Bidder is based outside the United Kingdom, the Bidder should ensure in advance of the Auction that the Lot can be exported from the U.K. and imported into the country of destination. No sale will be cancelled because the Lot may not be imported into the country of destination. 3.4.2 Prop Store’s recommended third-party independent freight agent, Precision Cargo, can advise Bidders on relevant export licensing regulations and may submit export licence applications upon request. Neither Prop Store nor its freight agents can guarantee that any licences, permits or consents will be granted. 4.1.1. Estimates represent Prop Store’s guide to Bidders and do not give any indication or representation of actual values or likely bids. Estimates do not include any Buyer’s Premium or VAT. 4.2.1. The Reserve Price is the minimum price the Seller will accept for a Lot. The Reserve Price will not be more than the lowest estimate given by Prop Store. Prop Store may disclose or keep confidential the Reserve Price at its entire discretion. 4.3.1. All bids are by individual Lot unless the auctioneer states to the contrary during the live Auction. Lots will usually be sold in their numbered sequence, unless the auctioneer announces otherwise. 4.3.2. All bids must be made in English only. 4.3.3. The auctioneer may accept bids from Bidders present in the sale room, via telephone, online or written bids delivered to Prop Store before the Auction commences, either using the form in this Buyer’s Guide or the online form at propstore.com. 4.3.4. Telephone Bidders must provide to Prop Store a list of Lots on which they intend to bid at least 24 hours before the start of the Auction. Telephone bids will only be accepted on Lots with low-end estimate of at least £500 and telephone calls may be recorded by or on behalf of Prop Store. 4.3.5. Written bids will be executed at the lowest possible price, taking into account the Reserve Price. 4.3.6. Online bids shall be made in accordance with and subject to the terms of the online auction platform access provider. 4.3.7. The auctioneer may also execute (non-identified) bids on behalf of the Seller up to the Reserve Price only. No bids may be made by the Seller in excess of the Reserve Price. 4.3.8. Save as expressly stated in this Buyer’s Guide, Prop Store accepts no liability for errors or omission in respect of bids made online, by telephone or in writing. 4.3.9. The auctioneer may accept or decline bids at his entire discretion. 5.1.1. Prop Store will notify successful Bidders and send (by email unless requested otherwise) a payment invoice setting out the Purchase Price and itemising the Hammer Price, Buyer’s Premium, and if applicable Buyer’s Expenses plus any applicable VAT within 7 calendar days of the end of the Auction. 5.2.1. Payment is due within 7 calendar days from receipt of invoice and must be made by the Buyer. Payments from any other source will not be accepted and shall be returned by Prop Store. 5.2.2. Payment must be in Pounds Sterling and may be made by electronic transfer, debit card, credit card (up to a maximum of £25,000) bankers draft or cash (up to a maximum of £5,000). Please quote the Lot number, invoice number and Bidder registration number when making payment to ensure it can be processed as efficiently as possible. 5.2.3. Credit card payments are only acceptable on the express understanding that the Lot is not returnable, refundable nor exchangeable and no charge card credit may be issued in the event of any such return. If payment is made by credit card, Buyer will not undertake any action or effort to stop payment, seek a refund, or attempt a charge back of such amounts – or any Credit Card Fee assessed thereon – by the issuer of the credit card. 5.2.4. [†] These lots are sold under standard VAT rules. For buyers within the EEC, 20% VAT will be due on the hammer price; 20% VAT will also be due on the Buyer’s premium. If EEC based buyer is a business outside of the U.K. who has provided their VAT number, no VAT will be due. When lots are exported outside the EEC (proof of export required or shipped by Prop Store or through Prop Store’s authorised shipper), no VAT will be due on the hammer price; 20% VAT will be due on the Buyer’s premium only ; unless items are exported to a registered business outside the EEC, in which case no VAT is due. [Ω] These lots have been temporarily imported from outside the EEC for sale at auction in London. For buyers within the EEC (private individuals or registered businesses), 5% VAT will be due on the hammer price; 20% VAT will also be due on the Buyer’s premium. When lots are exported outside the EEC (proof of export required or shipped by Prop Store or through Prop Store’s authorised shipper), no VAT will be due. [Ϻ] These lots are sold under the margin scheme. For buyers within the EEC (private individuals or registered businesses), no VAT will be due on the hammer price; 20% VAT will be due on the Buyer’s premium. When lots are exported outside the EEC (proof of export required or shipped by Prop Store or through Prop Store’s authorised shipper), no VAT is due. [US] These lots are currently located in Prop Store’s Los Angeles facility and will ship directly to the buyer from the Los Angeles facility. For buyers within the EEC (private individuals or registered businesses), no VAT will be charged by Prop Store on the hammer price; 20% VAT will be due on the Buyer’s premium For buyers outside the EEC, no VAT will be charged by Prop Store. 5.3.1. It is the Buyer’s sole responsibility to arrange and obtain all necessary export/import licences, permits and any other necessary consents before the Lot is shipped. 5.3.2. Prop Store’s third-party independent recommended freight agent will be able to deal with enquiries from Bidders and Buyers on importing and/or exporting of Lots. Precision Cargo is Prop Store’s freight agent of choice. 5.3.3. With regards to lots exported outside the EEC, if your Lots are shipped by Prop Store or through Prop Store’s authorised shipper, you will not be required to pay VAT when settling your invoice. If you are using any other shipper, or hand carrying your Lots outside the EEC, then VAT will be due on the invoice, which will be refunded once acceptable proof of export is provided by your shipper of choice. 5.3.4. To prove export of your Lots, on Ω Lots, obtain HMRC form C88 through Prop Store’s authorised shipper, which must be stamped by HMRC upon leaving the U.K.. On † or margin scheme Lots, obtain Notice 4 07 from Prop Store’s authorised shipper, which must be stamped by HMRC upon leaving the U.K.. In all cases Lots must be exported within no more than 3 months of the sale date, and proof of export must be reported via the appropriate form. 5.4.1. The Buyer is solely responsible for all shipping and delivery costs. Prop Store recommends Lots are custom-packed and recommends FedEx as its carrier of choice. For oversized Lots, Prop Store recommends Precision Cargo. 5.4.2. In the event of delay in shipping or failure to collect a Lot (for a reason outside Prop Store’s control) within 14 days of the due date for payment of Prop Store’s invoice (or such other date for shipping or collection agreed by Prop Store a storage fee of 3% of the Hammer Price per month shall be charged to the Buyer. If the Buyer has failed to pay the Purchase Price and the cost of shipping and handling, Prop Store, at its option may cancel the sale. These Terms and Conditions of Sale (“Conditions”) set out the legal relationship between the Bidder/Buyer and Prop Store and the Seller. By registering to bid and participate in a Prop Store Auction, you will be deemed to have read and agreed to be bound by these Conditions and the accompanying Buyer’s Guide, as set forth in the catalogue for the Auction and online atpropstore.com. These Conditions shall include the terms set out in the Prop Store Live Auction Buyer’s Guide, a copy of which has been made available to the Bidder. In the event of any conflict between these Conditions and the Buyer’s Guide, these Conditions shall take precedence. 2.1. See 2.1 of Buyer's Guide. 3.1. Unless expressly agreed otherwise, Prop Store acts as agent for the Seller. The contract for the sale of the Lot is made between the Seller and the Buyer. 4.1. All Lots are sold subject to their condition at the date of the Auction. By making a bid, the Bidder accepts the actual condition of the Lot and acknowledges that if a bid is successful, the Buyer will buy the Lot ‘as is’. 4.2. Prop Store’s staff are not professional restorers so descriptions of Lots, images and statements of condition in Prop Store’s brochure or on its website are for illustrative purposes only. Poster lots in the auction may have undergone restoration; Prop Store staff will make reasonable efforts to identify any restoration and this will be disclosed within the lot description. Prop Store cannot guarantee that colours are properly shown. Save for Prop Store Terms of Guarantee of Attribution all Lots are sold ‘as is’. Save for Prop Store Terms of Guarantee of Attribution all Lots are sold ‘as is’. Prop Store cannot and does not warranty any restoration or the longevity of any restoration work carried out at any point in a lot's lifetime. Bidders are encouraged to inspect Lots and satisfying themselves as to condition before bidding, taking independent professional advice where required. 4.5. Lots are sold only as collectibles and unless stated expressly to the contrary, Prop Store makes no representation or warranty that any Lot is fit for any other purpose. 4.6. Mannequins, display stands, scale measures and other display equipment are not included with the Lots unless expressly stated in the Lot description in the catalogue. 4.7. Estimates are simply a guide and should not be relied upon as to advice on value or the ultimate Purchase Price, which could be significantly higher. 5.1. Every Bidder must register with Prop Store (including providing evidence of identity) in accordance with the Buyer’s Guide. Personal information shall be used only in accordance with Condition 8 below. 5.2. From time to time, Prop Store may offer a Lot which it owns in whole or in part or in which it has a financial interest and any such Lot will be identified in the catalogue with the symbol Δ next to its Lot number. 5.3. Bidders are aware that, due to the one-of-a-kind nature of the materials, Prop Store only guarantees the provenance of Lots to the extent set out in the Terms of Guarantee of Attribution, and Prop Store will not accept returns of any material and will not issue refunds, credits or exchanges except as provided for in the Guarantee of Attribution. 5.4. As a courtesy to Buyers, Prop Store offers interest free payment plans on all auction Lots (see Condition 7.3 of the Conditions of Sale). 6.1. Prop Store reserves the right to refuse admission and/or participation at the Auction and to reject any bid. Bids may not be accepted from unregistered bidders and all Bidders must be 18 or over. 6.2. All bids must be made in GBP Sterling. The auctioneer has the right to exercise reasonable discretion in refusing any bid, advancing the bidding in such a manner as he may decide, withdrawing or dividing any Lot, combining any two or more Lots and, in the case of error or dispute, and whether during or after the sale, determining the successful Bidder, continuing the bidding, cancelling the sale or reoffering and reselling the Lot in dispute. If any dispute arises after the sale, then, in the absence of any evidence to the contrary the sale record maintained by the auctioneer will be conclusive. 6.3. Unless otherwise indicated, all Lots are offered subject to a Reserve Price. The Reserve Price will not exceed the low estimate printed in the catalogue. The Reserve Price will not be more than the lowest estimate given by Prop Store. Prop Store may disclose or keep confidential the Reserve Price at its entire discretion. 6.4. The auctioneer may open the bidding on any Lot below the Reserve Price by placing a bid on behalf of the Seller. The auctioneer may continue to bid on behalf of the Seller up to the amount of the Reserve Price, either by placing consecutive bids or by placing bids in response to other Bidders. 6.5. When making a bid, every Bidder acknowledges that such bid is a binding offer to buy the Lot at that price (plus the Buyer’s Premium, Buyer’s Expenses (if applicable),, all applicable taxes and any and all shipping charges, storage and other costs). A successful Bidder will be deemed to be the Buyer unless it has been explicitly agreed in writing with Prop Store before the start of the Auction that the Bidder is acting as agent on behalf of an identified third party acceptable to Prop Store (and registered with Prop Store), and only then will Prop Store regard that third party as the Buyer. In such circumstances, the Bidder acting as agent confirms that he is authorised to bind the third party and that the Buyer has been made aware of and accepts these Conditions. 6.6. Prop Store will use reasonable efforts to execute written bids delivered before the Auction for Bidders unable to attend the auction in person, by an agent or by telephone or online. All such written bids must be made on Prop Store’s Absentee Bids Form (in the catalogue). 6.7. If Prop Store receives written bids on a particular Lot for identical amounts, and at the auction these are the highest bids on the Lot, it will be sold to the person whose written bid was received and accepted first. 6.9. 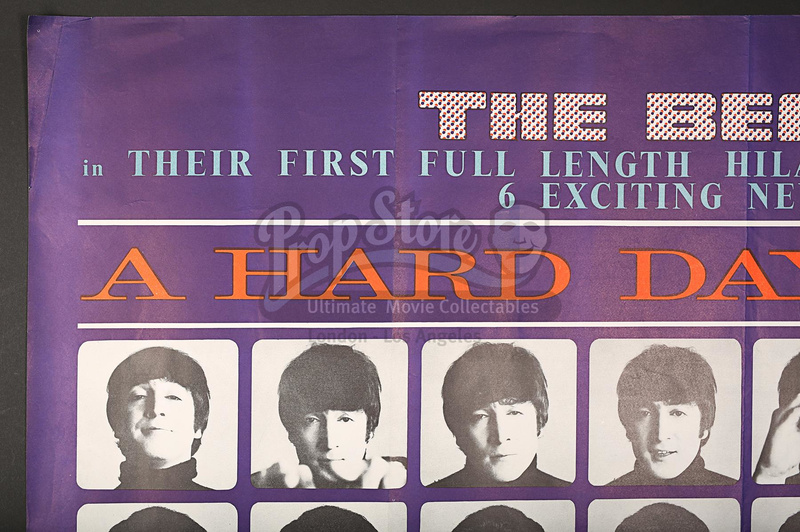 The Auction will be tracked on a video or digital screen, which may display, among other things, a photograph of the Lot offered for sale and the then-current bid. Bidders understand and agree that errors may occur in its operation and, except as expressly stated in the Buyer’s Guide or these Conditions, Prop Store shall have no liability arising out of or related to any errors or omission in respect thereto. 6.10. By participating in and/or attending the Auction and signing the registration form, each person consents to be filmed and/or photographed and agrees and authorises Prop Store to use and publish such film and/or photographs, name and likeness for use in (1) providing online access to the Auction, (2) recording the results of the Auction, (3) print, digital, online and all other media for marketing purposes (including without limitation, on Prop Store’s website, YouTube and other online platforms) and (4) in any other Prop Store publications of whatever nature. The participant releases Prop Store and holds it harmless from any reasonable expectation of confidentiality or privacy associated with such images and releases Prop Store and any third parties involved in the making, creation or publication of the images or any marketing or other materials from all and any liability for claims made in respect of such publication. Publication of the images in whatever format confers no right of ownership on the individual or right to royalties or payment. A designated area will be set aside if you do not wish to be filmed. If you wish to withdraw consent, email support@propstore.com. 6.11. Subject to the auctioneer’s reasonable discretion, the Bidder placing the highest bid accepted by the auctioneer will be the Buyer and the striking of his hammer marks the acceptance of the highest bid and the conclusion of a contract for sale between the Seller and the Buyer. Risk and responsibility for the Lot (including frames or glass where relevant) passes to the Buyer on the date seven calendar days from the date of the sale or on collection by the Buyer if earlier and the Buyer should arrange insurance cover for the Lot if required. 7.1. Prop Store will notify successful Bidders and send (by email unless requested otherwise) a payment invoice setting out the Purchase Price and itemising the Hammer Price and Buyer’s Premium plus any applicable VAT within 7 calendar days of the end of the Auction. 7.2. Unless a payment plan (as set out in condition 7.3 below) has been agreed by Prop Store, payment is due within 7 calendar days from receipt of invoice and must be made by the Buyer. Payments from any other source will not be accepted and shall be returned by Prop Store. 7.3. Payment plans will be available in 1, 2, or 3 month increments. Bidders wishing to utilise the payment plan service, if approved by Prop Store, will be responsible for paying a 20% deposit on their Lots within 7 calendar days of receiving their invoice. The balance will then be split over 1, 2 or 3 months per the Buyer’s selection. If the 1 month option is selected, the remaining balance on the Lot will be due 30 days after the deposit date. If the 2 month option is selected, half of the remaining balance will be due 30 days after the deposit date and the remaining half 30 days after that, and so on. 7.4. Prop Store offers no grace period on payment plan deadlines. If the Buyer does not adhere to payment deadline as agreed under the terms of the payment plan, the Buyer will have defaulted. In the event of default all funds already paid to Prop Store will be forfeited by the Buyer, and title of the Lot will not transfer to Buyer. Prop Store and the Seller shall also be entitled to all remedies for non-payment as described below and at law. 7.5. Title in the Lot will pass to Buyer and the Lot will be made available for collection by the Buyer only when Prop Store is completely satisfied that all monies owing have been paid in full. 7.6. Payment must be in Pounds Sterling and may be made by electronic transfer, debit card, credit card (up to a maximum of £25,000) bankers draft or cash (up to a maximum of £5,000). Please quote the Lot number, invoice number and Bidder registration number when making payment to ensure it can be processed as efficiently as possible. 7.7. Credit card payments are only acceptable on the express understanding that the Lot is not returnable, refundable nor exchangeable and no charge card credit or refund may be issued in the event of any such return. If payment is made by credit card, Buyer will not undertake any action or effort to stop payment, seek a refund, or attempt a charge back of such amounts – or any Credit Card Fee assessed thereon – by the issuer of the credit card. 7.8. [†] These lots are sold under standard VAT rules. For buyers within the EEC, 20% VAT will be due on the hammer price; 20% VAT will also be due on the Buyer’s premium. If EEC based buyer is a business outside of the U.K. who has provided their VAT number, no VAT will be due. When lots are exported outside the EEC (proof of export required or shipped by Prop Store or through Prop Store’s authorised shipper), no VAT will be due on the hammer price; 20% VAT will be due on the Buyer’s premium only; unless items are exported to a registered business outside the EEC, in which case no VAT is due. [US] These lots are currently located in Prop Store’s Los Angeles facility and will ship directly to the buyer from the Los Angeles facility. For buyers within the EEC (private individuals or registered businesses), no VAT will be charged by Prop Store on the hammer price; 20% VAT will be due on the Buyer’s premium. For buyers outside the EEC, no VAT will be charged by Prop Store. 7.9. The Buyer will not acquire title to the Lot until all amounts due to the Seller and Prop Store from the Buyer have been received by Prop Store in cleared funds even in circumstances where Prop Store has released the Lot to the Buyer. 7.10. By registering for this auction the Buyer authorises Prop Store to charge the credit card provided at registration for all Lots purchased at the auction, and any future auction a Bidder may participate in, if not paid in full within 7 calendar days after the auction close. 7.11. If the Buyer does not make any payment due to Prop Store by the due date for payment, Prop Store may charge interest on the overdue amount at the rate of 5% a year above the base lending rate of LloydsTSB Bank plc from time to time. This interest shall accrue on a daily basis from the due date until the date of actual payment of the overdue amount, whether before or after judgment. The Buyer must pay Prop Store interest together with any overdue amount. 7.12.9. take such other action as Prop Store deems necessary or appropriate. If Prop Store resells the Lot under condition 7.12.3 above, the Buyer shall be liable for payment of any deficiency between the total amount originally due to Prop Store and the amount received upon resale as well as all reasonable costs, expenses, damages, legal fees and commissions and premiums of whatever kind associated with both sales or otherwise arising from the default. If Prop Store pays any amount to the Seller under condition 7.12.4 above, the Buyer acknowledges that Prop Store shall have all of the rights of the Seller, however arising, to pursue the Buyer for such amount. 7.13. Prop Store shall be entitled to retain Lots sold until all amounts due have been received in full in good cleared funds or until the Buyer has performed any other outstanding obligations as Prop Store shall reasonably require. Subject to this, the Buyer shall collect, or have shipped or collected for shipment, purchased Lots within 7 calendar days from the date of the sale unless otherwise agreed between Prop Store and the Buyer. Lots can be collected in person by appointment only. 7.14. Each Lot will require a custom packing service and by bidding on a Lot a Bidder agrees to pay all relevant shipping costs. Prop Store’s carrier of choice is FedEx, although some Lots will require special freight service. 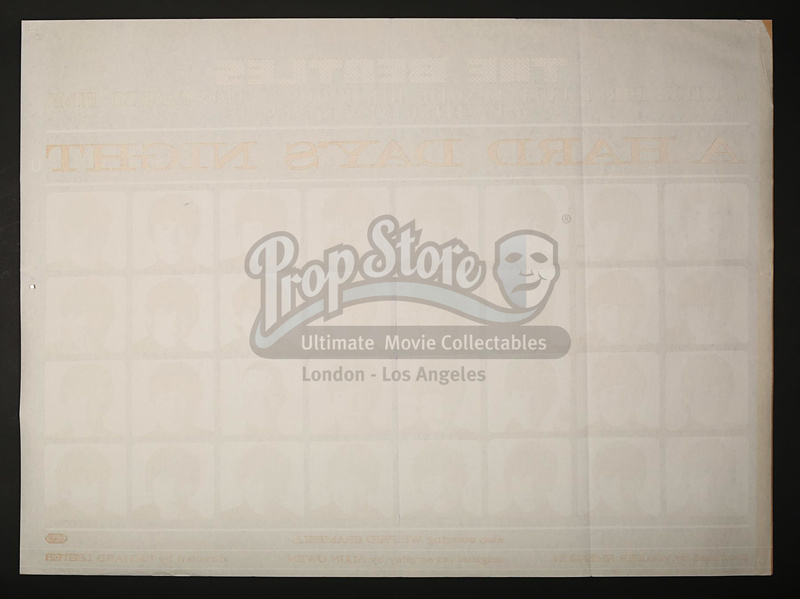 Potential shipping estimates can be obtained by emailing shipping@ propstore.com detailing the Lot number of interest and the shipping address prior to the auction. 7.15. Prop Store recommends working with its preferred third-party independent freight agent Precision Cargo on any questions regarding importing and exporting Lots. 7.16. Although Prop Store shall use reasonable efforts to take care when selecting third parties for these purposes, the Buyer will contract directly with such third party and Prop Store accepts no liability or responsibility for the acts or omissions of any such third parties. Similarly, where Prop Store suggests other handlers, packers or carriers, its suggestions are made on the basis of its general experience of such parties in the past and Prop Store is not responsible to any person to whom it has made a recommendation for the acts or omissions of the third party concerned. 7.17. It is the Buyer’s sole obligation and responsibility to be aware of, to comply with, and to pay for all relevant import duties, taxes, VAT, customs and other fees charged in the Buyer’s local jurisdiction. Prop Store will ship all packages with the full value of the Lot declared. Buyer understands and agrees that Prop Store shall have no obligation or responsibility for any import duties, taxes, VAT, customs, shipping or other charges for the Lots shipped. Failure by the Buyer to pay all necessary amounts may result in the relevant authorities returning the Lot to Prop Store and in those circumstances the Buyer will be charged and will pay storage cost and Prop Store’s additional reasonable costs and expenses. 7.18. It is the Buyer’s responsibility to ensure that any Lot purchased from Prop Store enters the shipping location lawfully, that all duties and taxes have been paid and that all required export procedures, regulations, and laws were properly complied with. Buyer understands and agrees that Prop Store shall have no obligation or responsibility for complying with any export procedures, regulations, or laws applicable to the Lot. 7.19. Unless otherwise agreed by Prop Store in writing, the fact that the Buyer wishes to apply for an export licence does not affect or postpone the Buyer’s obligation to make payment in accordance with Prop Store’s payment terms nor Prop Store’s right to charge interest or storage charges on late payment. If the Buyer requests Prop Store to apply for an export licence on his or her behalf, Prop Store shall be entitled to make a charge and be paid for this service. Prop Store shall not be obliged to rescind or cancel a sale nor to refund any monies paid by the Buyer to Prop Store as a result of or related to the Buyer’s failure or inability to obtain an export license. 7.20. Where Lots are not collected within 14 calendar days from the due date of payment, whether or not payment has been made, a storage fee of 3% of the Hammer Price per month shall be charged to the Buyer. If the Buyer has failed to pay the Purchase Price and the cost of shipping and handling, Prop Store, at its option may cancel the sale. 8.1.5. inform the Bidder about important auction updates. 9.1. If Prop Store fails to comply with these Conditions it is responsible for loss or damage a Buyer suffers that is a foreseeable result of Prop Store’s breach or its negligence. Prop Store is not responsible for any loss or damage that is not foreseeable. Loss or damage is foreseeable if an obvious consequence of Prop Store’s breach or if contemplated by the Buyer and Prop Store at the time the hammer falls on the Lot at the Auction. 9.2. Subject to condition 9.3, Prop Store’s liability shall be limited to the amount actually paid for the Lot by the Buyer. Save to the extent required by law, in no event shall Prop Store be liable for incidental or consequential damages of any kind. 9.3.3. breach of the terms implied by sections 12, 13, 14 and 15 of the Sale of Goods Act 1979 (title, description, quality and fitness for purpose) save to the fullest extent permissible at law. 11.1. The copyright in all images, illustrations and written material produced by or for Prop Store relating to a Lot (including the contents of the Auction catalogue), is and shall remain at all times the property of Prop Store and shall not be used by the Buyer, nor by anyone else, without Prop Store’s written consent. Prop Store and the Seller make no representation or warranty that the Buyer of a Lot will acquire any copyright or other reproduction rights in it. 11.2. In the catalogue descriptions, Prop Store takes steps to identify and provide provenance for Lots offered at auction. In many cases, the Lots offered were used in or in conjunction with motion pictures or other programmes and information is furnished in order to fully identify and describe the Lot offered at Auction, including photographs and illustrations. Prop Store in no way claims any connection to or relationship with the producers of the motion picture or other programme. In all cases, the use of the titles or other elements of a motion picture or other programme is for informational purposes only. Prop Store will not be liable or responsible for any failure to perform, or delay in performance of, any of its obligations under these Conditions that is caused by an event outside its control, that being any act or event beyond Prop Store’s reasonable control, including without limitation strikes, lock-outs or other industrial action by third parties, civil commotion, riot, invasion, terrorist attack or threat of terrorist attack, war (whether declared or not) or threat or preparation for war, fire, explosion, storm, flood, earthquake, subsidence, epidemic or other natural disaster, or failure of public or private telecommunications networks. Prop Store’s obligations shall be suspended and time for performance extended until such time as the event outside it’s control is over, following which a new collection or shipping date can be agreed. 13.1. If any part of these Conditions is found by any court to be invalid, illegal or unenforceable, that part shall be discounted and the rest of the Conditions shall continue to be valid to the fullest extent permitted by law. 13.2. The contract is between the Seller, Buyer and Prop Store and no other person shall have any rights to enforce any of its terms. 13.3. If Prop Store fails to insist on performance of any of a Buyer’s obligations under these Conditions, or if it delays in doing so, that will not mean that Prop Store has waived its rights against the Buyer and does not mean the Buyer no longer has to comply with those obligations. 13.4. These Conditions are governed by English law, without regard to its choice of law provisions. The Parties agree that any dispute or claim (including non-contractual disputes or claims) arising out of or in connection with this agreement or its subject matter or formation may be brought in any court of competent jurisdiction located in England or Wales or, alternatively, in any court of competent jurisdiction where Prop Store or the Bidder/Buyer resides, at the option of the Party bringing the claim, only. The Parties expressly agree to the jurisdiction of such courts and agree to submit to the jurisdiction of such courts. The prevailing party shall be entitled to an award of all attorneys’ fees, costs and expenses incurred by it/him/her in connection with the dispute. “Attorneys’ fees and expenses” includes, without limitation, paralegals’ fees and expenses, attorneys’ consultants’ fees and expenses, expert witness’ fees and expenses, and all other expenses incurred by the prevailing party or its attorneys in the course of their representation of the prevailing party in anticipation of and/or during the course of the litigation, whether or not otherwise recoverable as “attorneys’ fees” or as “costs” under applicable law; and the same may be sought and awarded in accordance with applicable procedure as pertaining to an award of contractual attorneys’ fees. 13.5 By registering for this auction, the supplied card will automatically have a sum of £0.01 held and subsequently returned within 30 working days to verify the validity of the card. 13.6 The buyer is solely responsible for ascertaining that each lot sold with copyright is otherwise cleared for publication including but not limited to satisfying any publicity right that persons appearing in an image may have under any statute or common law. Neither the consignor nor Prop Store Ltd makes any representation or warranty as to any matters that need to be cleared prior to publication. No representation or warranty is made regarding copyright outside of the United Kingdom. All publication issues should be referred to the buyer’s own professional advisors. All representations or warranties as to copyright or rights to publish are solely made by the consignor and not Prop Store Ltd; the buyer agrees that Prop Store Ltd. will not be liable to Buyer in any respect for alleged breach of any such representation or warranty. Copyright © 1998-2016 Prop Store Ltd. Registration No. 8622002 Registered Office: Bourbon Count, Nightingales Corner, Little Chalfont, Bucks HP7 9QS Country of Incorporation: England. All rights reserved. All other logos, screen captures and trademarks are property of their respective owners who may or may not be affiliated with the Prop Store Ltd. Database development by Magic Web Solutions.